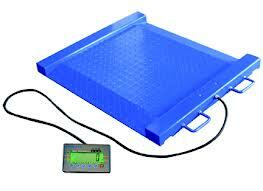 PTM platform scale feature a low profile design for easy loading and unloading. The range incorporates a non-slip checkered plate for added grip. Heavy duty rubber feet support the four loadcells ensuring quality and longevity of the bases. Handles and wheels for portability. SKU: ptm001. Category: Floor Scale. The PTM low profile platform is ideal for drums and wheelchairs. 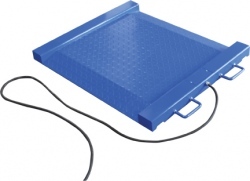 The easy access ramps on both sides offers smooth transitions from the floor to the weighing platform and the diamond checked platform offers a durable weighing area. With handles and wheels for easy portability the PTM can be used where it’s needed in a warehouse or medical facility. 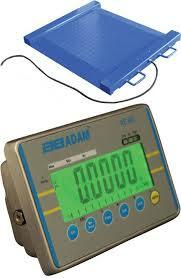 The PTM is available with the GK indicator or AE 401 indicator to give a range of different features and functions. The long cable lets the indicator be placed where it is needed out of the way of the platform for easy viewing. The GK indicator allows for a numeric tare value to be entered where the AE 401 indicator is IP65 sealed for dust and water environments.